Soil Water Content: the moving ‘waves’ in this area represent the amount of water stored in the top ~20 inches of soil. Streamflow: The particles flowing from left to right in the middle of the painting represent stream flow. Evaporation: The hazy white mist rising from stream, soil and other surfaces is evaporation. Transpiration: The hazy mist (greenish) rising from the surface of the vegetation represent transpiration. Precipitation: The particles seen occasionally moving from top to bottom of screen represent precipitation (as rain and snow). Snowpack: In the winter, the snowpack can be seen growing and shrinking in proportion to actual snow depth. Set to play visualization from a date in the past, for a specific hydrologic event, or to reset to current date. Toggle on to hear the sound of the Hubbard Brook. The background image of WaterViz is an original painting by artist Xavier Cortada, with sections for each component of the water cycle. Each section is animated by moving particles. The number of particles and the speed with which they move are directly proportional to the data generated by environmental sensors in the Hubbard Brook. Hover over each hotspot to learn more! Music Now, click to play. Music Now sonifies the most recent hour of water and weather data at the Hubbard Brook Experimental Forest, NH. This animation uses Unity WebGL and is compatible with most browsers but is not currently compatible with mobile devices. Live-streaming data power this animation. 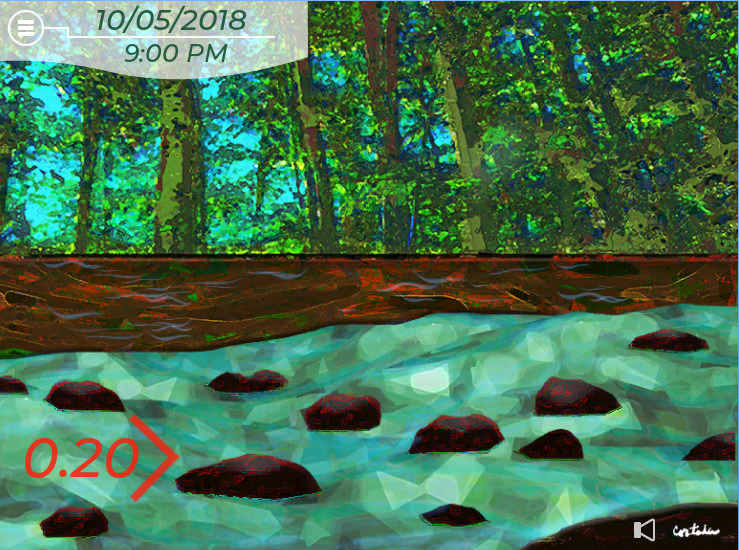 WaterViz accurately reflects water moving through a small forested watershed in New Hampshire, in near real-time. We invite you to explore WaterViz and learn more about the science and art behind our project. The data that drive WaterViz come from a variety of sensors installed at Hubbard Brook. An hourly processing routine gathers data from the different sensor files, merges these data, and updates the WaterViz database. More than a dozen measurements are used for WaterViz and related data visualization and sonification. This table shows a subset of the most recent hour of data available. Soil is made of many small mineral and organic particles, with pore spaces between them that can be filled with air or water. The technical term for the amount of water stored in a soil is “soil water content.” Soil water content is the percentage of a soil volume that is water. In other words, if soil water content is 25%, that means that 1 cubic yard of soil contains 0.25 cubic yards of water. At Hubbard Brook, the top 20 inches of soil in our watersheds can hold approximately 8.4 inches of water. The current amount of that capacity is shown here as water in a barrel. When the top 20 inches of soil are at maximum soil water holding capacity, the soil water content is ~8.4 inches, and the barrel is 100% full. Additional precipitation entering the watershed will most likely flow directly out of the watershed, and may cause downstream flooding. 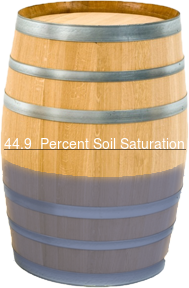 Conversely, when the top 20 inches of soil are dryer, or below maximum soil water holding capacity, the soil water content is less than 8.4 inches, and the barrel is proportionately less full. The soils now have the ability to retain incoming precipitation, and may store water and buffer downstream ecosystems from flooding. This graph shows water input and output from the system. Water input is measured by precipitation sensors, and water output is the sum of stream discharge and evapotranspiration (modeled from air temperature, relative humidity, wind speed, solar radiation, and barometric pressure).